Female 33 years old complains pain in right arm when she has her arm in abduction and elevated position. Fig 1: Right side of the image indicates normal dimension on transversal section of the R subclavian artery (arrow) before the test by which the patient elevates her arm in external rotation; left side of the image indicates small dimension on transversal section of the R subclavian artery during the test due to compression between the anterior scalene muscle anteriorly (white arrow head) and exostosis of the first rib posteriorly (black arrow). Figure 2:The spectrum waveform of the radial artery before and during the test. 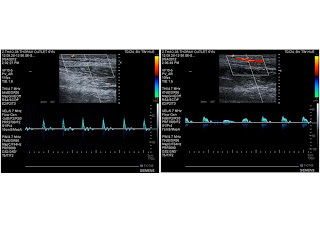 Fig 3: Longitudinal section of the R subclavian artery indicates the stenosed segment with high flow velocity displayed by aliasing phenomenon and post-stenotic dilatation segment as well. 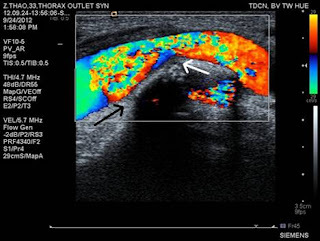 Note that focal thickening of the wall of the R subclavian artery at stenotic region (white arrow). 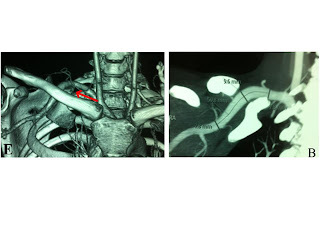 Fig 4: CT Angio images of the R subclavian artery demonstrate the stenosed segment due to exostosis of the first rib (red arrow) and poststenotic dilatation segment. Diagnosis: Thoracic outlet syndrome in the first space. Discussion: Thoracic outlet syndrome (TOS) is the name of a variety of conditions attributed to compression of the neurovascular structures as they traverse the thoracic outlet. (TOS) can occur at 3 spaces: 1/ The first space is the interscalene triangle. It is bordered by the anterior scalene muscle, the middle scalene muscle, and the upper border of the first rib. The interscalene triangle is the most common site for neural compression, vascular compression. 2/ The second space is the costoclavicular triangle, which is bordered by the clavicle, first rib, and scapula and contains the subclavian artery and vein and the brachial nerves; 3/ The third and final space is beneath the coracoid process just deep to the pectoralis minor tendon; it is referred to as the subcoracoid space. 1.Daryl A Rosenbaum, MD; Chief Editor: Sherwin SW Ho, MD. Thoracic Outlet Syndrome . 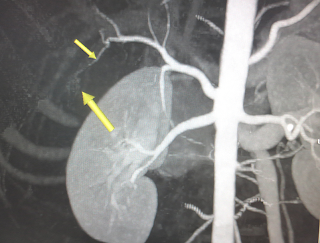 http://emedicine.medscape.com. 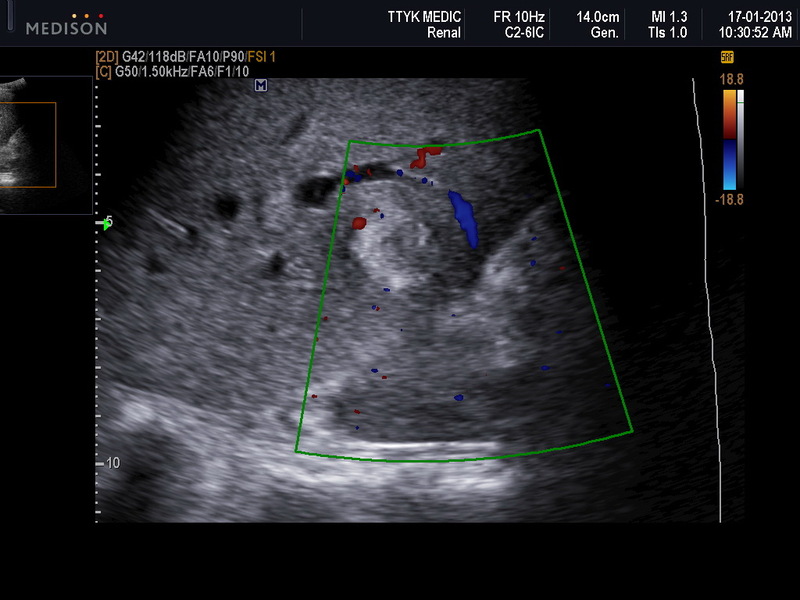 Woman 24 yo, amenorrhea for 2 weeks, was suspected in pregnancy, but ultrasound at pelvis showed uterus without gestational sac or mass beside uterus. Ultrasound scan at liver detected one hyperechoic focal, hypovascular, round shape, size of 1.86 cm with fluid in central mass. Blood test beta HCG is of 34k unit. 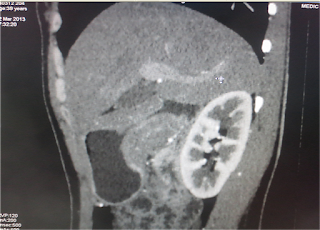 Do you thing it is an ectopic pregnancy in liver and how to make sure the diagnosis for this case?. 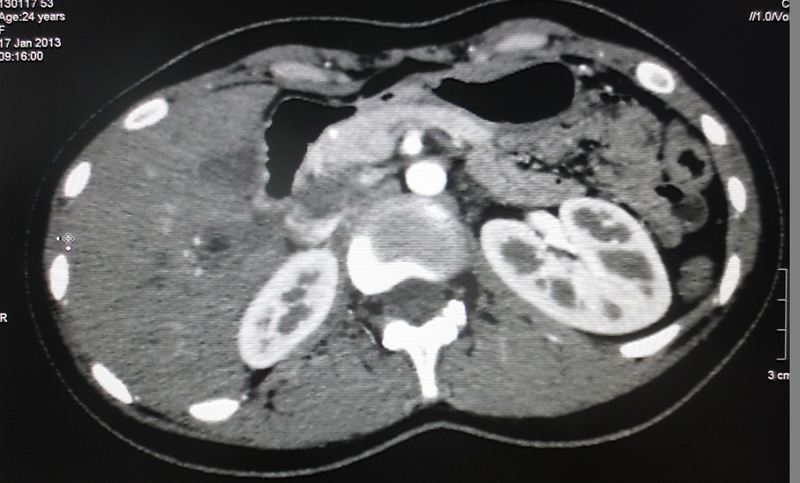 MDCT with CE was done for detection the intrahepatic focal which was near the gall-bladder, size of 2cm, hypodense cystic central and blood supply by hepatic artery (see 3 CT images). ULTRASOUND AND MSCT LIVER SUGGESTED PRIMARY LIVER PREGNANCY WITH high value of beta HCG 32 k unit/ml. Methotrexate is drug of choice for treatment, after 2 weeks of injection of methotrexate the blood test beta HCG will be dropped to normal, the liver focal will get smaller as a cyst. 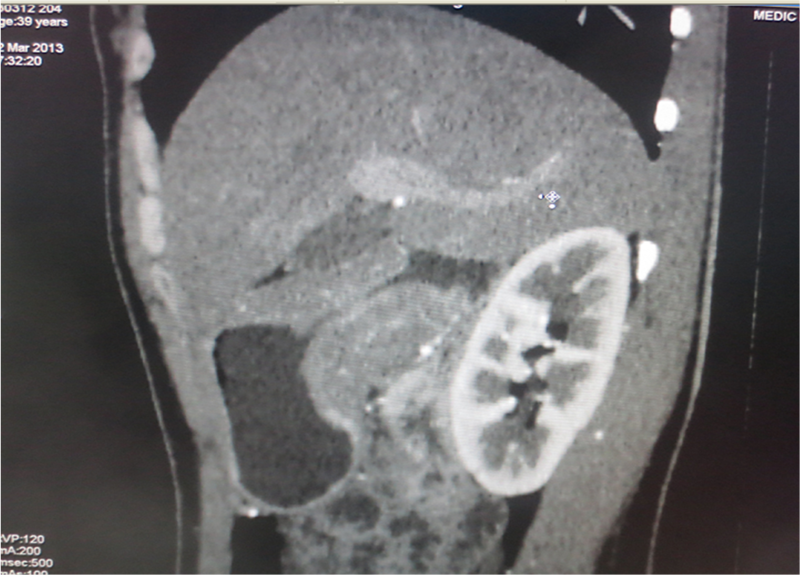 This is a case of PLP (PRIMARY LIVER PREGNANCY) succesfully treated with METHOTREXATE. NO NEED of OPERATION. 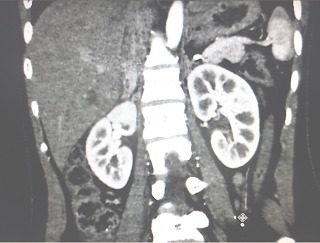 IT IS RESULT OF EARLY DIAGNOSTIC of PLP. 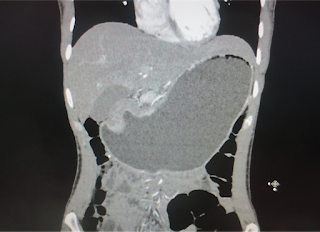 Woman 39yo, anorexia, vomitting and loss weight rapidly. 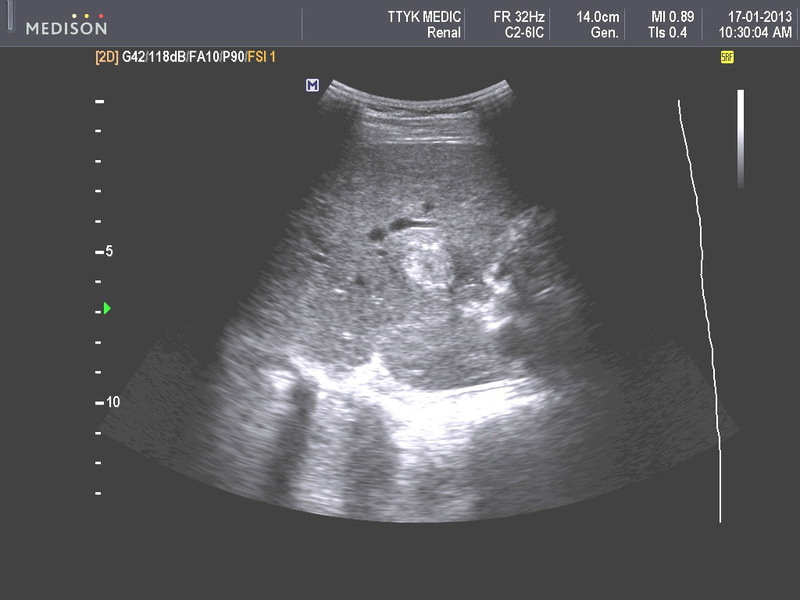 Ultrasound abdomen first, see the dilated stomach too big, and the antrum thickening of the wall like the uterus cervix (pseudocervix sign). At the pelvis, uterus was covered around by ascites (see 3 ultrasound pictures). 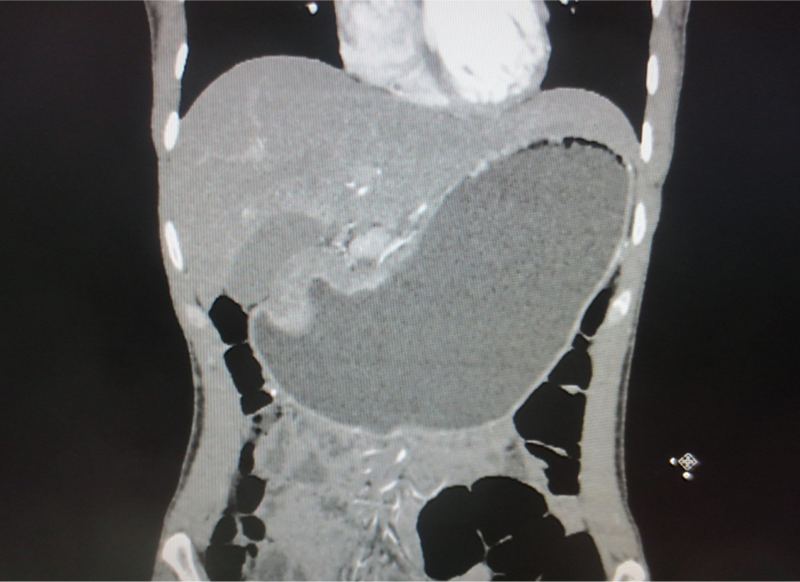 MDCT ABDOMEN WAS DONE, some FRONTAL, AND SAGITAL SECTIONS SHOWED THE ANTRUM THISKENING OF THE WALL. GASTRO-ENDOSCOPY SAW THE ANTRUM STENOSIS. BIOPSY WAS PERFORMED. WAIT FOR MICROSCOPY REPORT. ALL OF THE DIAGNOSTIC PROCEDURES SPENT FOR 2 HOURS. 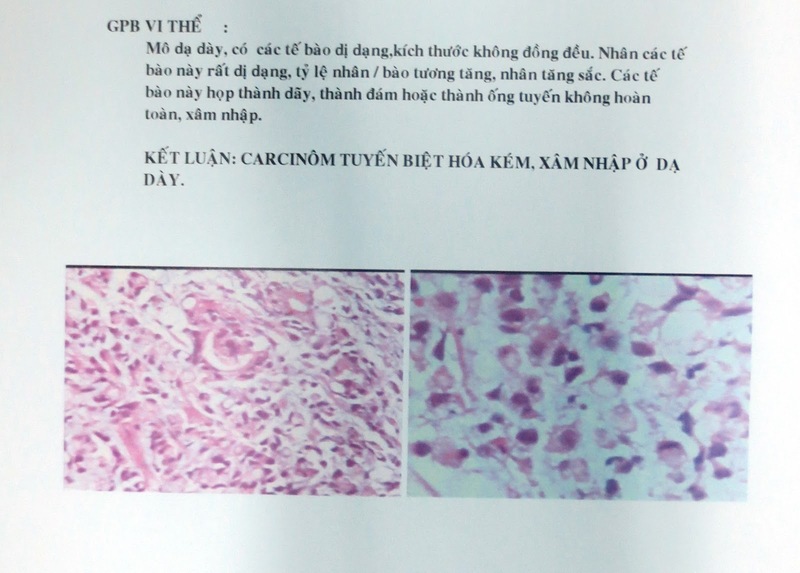 Biopsy report was gastric cancer. 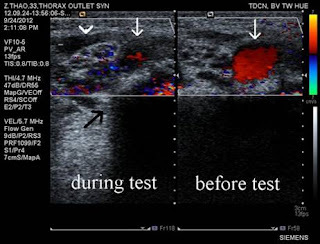 Woman 77 yo, by herself detected one lump at her left breast. 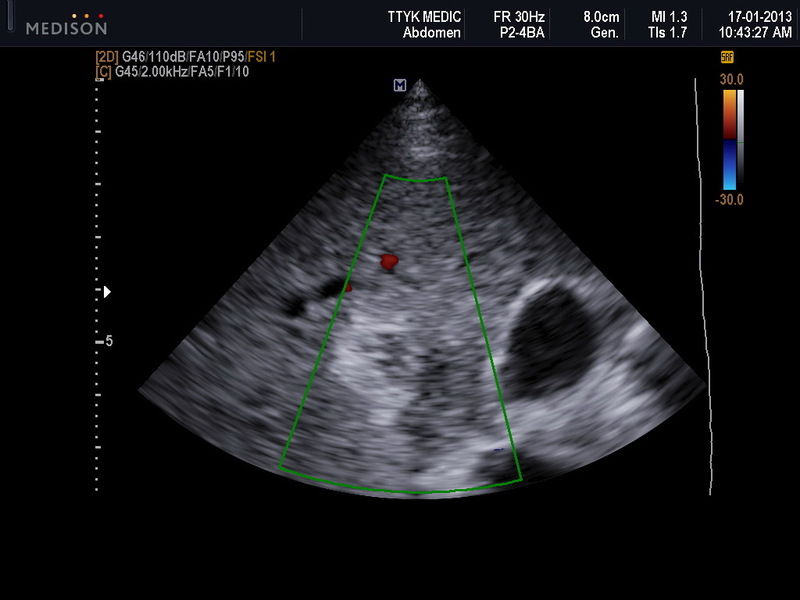 Ultrasound examination: this mass was at section of 10 hr of left breast, size arround 2 cm ( B mode US picture). It was hypoechoic and irregular border, with very strong shadowing (image 2 and 3), and on CDI, hypervascular and very high PI. On PDI again, this tumor was hypervascular; axillary scan no detected nodes. 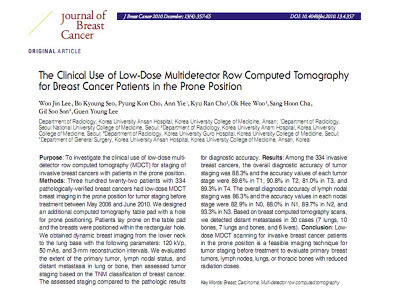 Ultrasound first suggests breast cancer, next step is mammography or MRI. 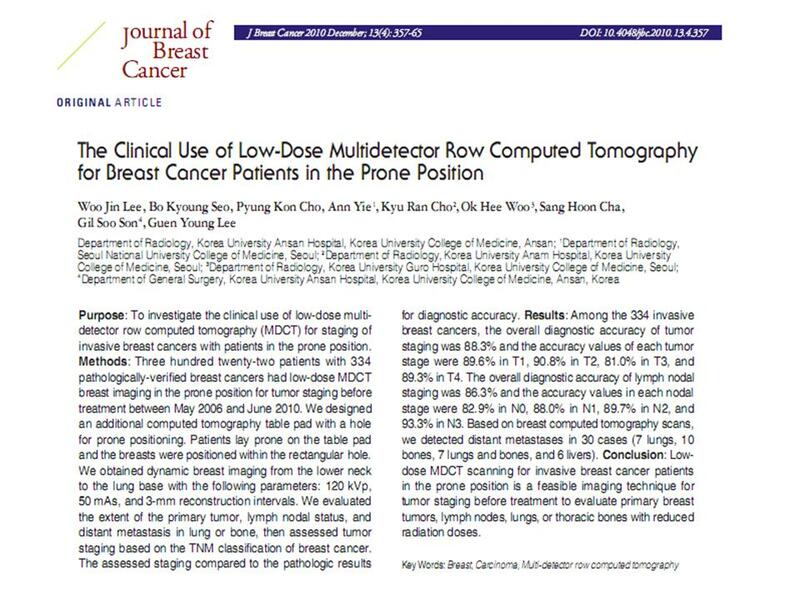 THIS PATIENT REFUSED TO DO MAMMOGRAPHY AND MRI BECAUSE THE FIRST TECHNIQUE WAS PAINFUL AND THE SECOND ONE MADE CLAUSTROPHOBIA FOR HER LONG TIME AGO. 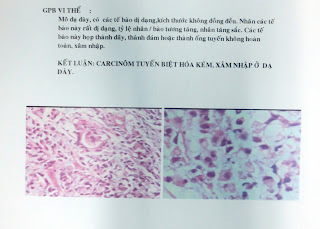 MSCT non CE showed that tumor was small size of 1.8 cm, spiculate hypercalcification and detected no lymphatic nodes of axillary or retrosternum, it was staging I.
Biopsy was done and report was breast cancer type NOS.